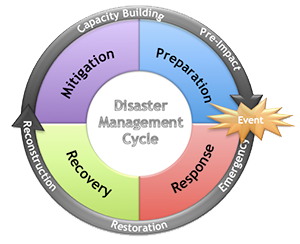 The Department of Emergency Services- Emergency Management Division promotes a comprehensive emergency management program to mitigate the community’s impacts from manmade, natural or technological disasters and potential catastrophic incidents by utilizing mitigation, preparedness, response, and recovery strategies. Emergencies and disasters can strike anywhere at anytime. Sometimes, they can happen without warning, forcing residents to take shelter in their homes or evacuate their neighborhoods with little or no warning. Weathering these types of situations successfully requires that you understand what a disaster could mean for you and your family. The Federal Emergency Management Association (FEMA) provides a worksheet to help you get started. FEMA also provides information on emergency preparedness for military families. •First, determine the types of disasters/emergencies that are most likely to happen and what to do in each case. •After a disaster, it's often easier to place long distance calls than to get a local call to connect. Identify an out-of-town friend or relative to be your family emergency contact. All family members should call this person in an emergency to check in. •Your entire family should know the name and contact information for your emergency contact. Don't rely on cell phones; supply coins and prepaid phone cards as well. •Take a first aid, CPR or other class so that you're prepared with the knowledge to help yourself and others if needed. •If you don't own a vehicle or drive, the city will provide transportation in a mandatory evacuation. But, if you want to go to a shelter or leave town if evacuation is not mandatory, you'll need to make your own arrangements. Determine these in advance. •Decide where you and your family will meet in case you can't return home. Keep a record of the location's address and phone number, as well as the phone numbers of your family members, with you at all times. •Keep a visual or written record of your possessions to help you claim losses in the event of damage. Include photos of cars, boats and recreational vehicles. Get professional appraisals of jewelry, collectibles, artwork or other items that might be difficult to evaluate. Also, photograph the exterior of your home. Include the landscaping that might not be insurable, but does increase the value of your property for tax purposes. Make copies of receipts and canceled checks for valuable items. •Include pets in your emergency planning. •Talk to neighbors about how to work together in an emergency. Find out if anyone has specialized equipment (i.e. power generator) or expertise (i.e. doctor) that might help in a crisis. Decide who will check on elderly or disabled neighbors. •Check your home for materials and items that might pose a hazard during a disaster. •Locate and learn how to turn off utilities (i.e. gas, electricity, water) if necessary. •Make sure smoke and carbon monoxide detectors are installed with fresh batteries. •Equip your home with a water hose, fire extinguisher and generator. Finally, make sure the entire family knows how to execute the disaster plan. This will help ensure the most efficient use of time and resources. What to do when you are caught at home in a storm? Legislation enacted by the 2015 General Assembly combined Virginia’s three sales tax holidays into one three-day holiday beginning the first Friday in August at 12:01 a.m. and ending the following Sunday at 11:59 p.m. This year’s sales tax holiday is August 5-7.